there’s nothing i love more than a lazy, laid-back saturday morning. everyone wakes up when they want to wake up. no one is rushing to get out of the house on time, or to shove that last bit of cereal in their mouth while simultaneously tying their shoes. and there’s just something about having a big, delicious breakfast that makes saturday worth waiting for. 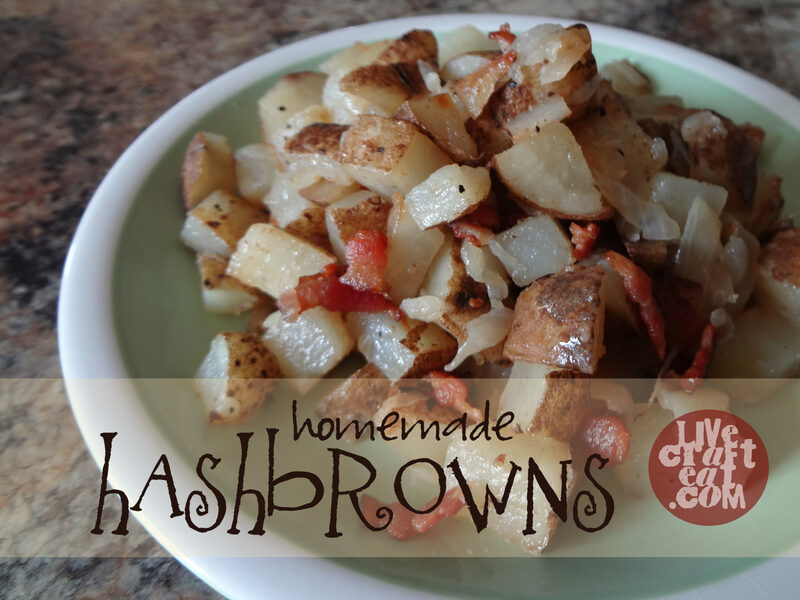 this past week we made hashbrowns from scratch – it was my first time making them using fresh potatoes (vs. buying a bag of frozen hashbrowns…which, by the way, once you’ve tried this recipe you will not be able to go back to the frozen kind…so beware!). my husband gives an honest review after every new recipe we try, and he really liked these. that says it all. Bake potatoes at 375F for 45 minutes, or until fork-tender. Cut into 1-inch pieces. Meanwhile, chop bacon and fry in frying pan. When bacon is done, remove from pan. Drain all but 1 tablespoon of bacon fat. Add in about 1 tablespoon vegetable oil. Sautee onion until browned. Remove onions from pan. Put potatoes in pan. Add salt and pepper to taste, stir, and let potatoes sit for a few minutes, untouched. Flip potatoes, and let cook for a few minutes more, untouched. Add the cooked onions and bacon and stir. Serve hot.